On June 10, 2011, NASA‘s Lunar Reconnaissance Orbiter spacecraft pointed the LRO Camera NACs to capture a dramatic sunrise view of Tycho crater. A very popular target with amateur astronomers, Tycho is located at 43.37°S, 348.68°E, and is about 51 miles (82 km) in diameter. The summit of the central peak is 1.24 miles (2 km) above the crater floor. The distance from Tycho’s floor to its rim is about 2.92 miles (4.7 km). Many rock fragments (“clasts”) ranging in size from some 33 feet (10 m) to hundreds of yards are exposed in the central peak slopes. Were these distinctive outcrops formed as a result of crushing and deformation of the target rock as the peak grew? Or do they represent preexisting rock layers that were brought intact to the surface? 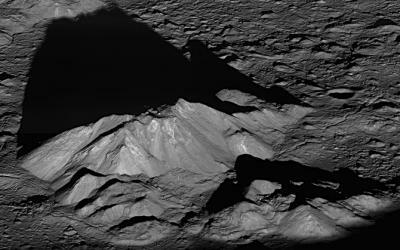 Tycho’s features are so steep and sharp because the crater is only about 110 million years old — young by lunar standards. Over time micrometeorites and not-so-micro meteorites, will grind and erode these steep slopes into smooth mountains. For a preview of Tycho’s central peak may appear like in a few billion years, look at Bhabha crater. On May 27, 2010, LRO captured a top-down view of the summit (below), including the large boulder seen in the above image. Also note the fractured impact melt deposit that surrounds the boulder. And the smooth area on top of the boulder, is that also frozen impact melt? These images from the LRO Camera clearly show that the central peak formed very quickly: The peak was there when impact melt that was thrown straight up during the impact came back down, creating mountains almost instantaneously. Or did the melt get there by a different mechanism? The fractures probably formed over time as the steep walls of the central peak slowly eroded and slipped downhill. Eventually the peak will erode back, and this massive boulder will slide such that the big boulder will meet its demise as it slides 1.24 miles (2 km) to the crater floor. What Causes an Eclipse of the Moon?